Also: Another beta is coming before launch, and skeletons are guarding massive piles of gold. Sea of Thieves, Rare's MMO pirate party for Xbox One and Windows, is barrelling full speed ahead towards its March 20 release date. There's still a lot of deck-swabbing to be done before its maiden voyage, though. Rare recently announced plans to perform another scale test to put the servers through their paces, and if you were part of the closed beta, you can help. According to the official blog for Sea of Thieves, the latest scale test starts today (February 23) at 12 a.m. GMT (that's 4 a.m. PT) and ends Sunday, February 25th at 10 a.m. GMT (that's 2 a.m. PT). 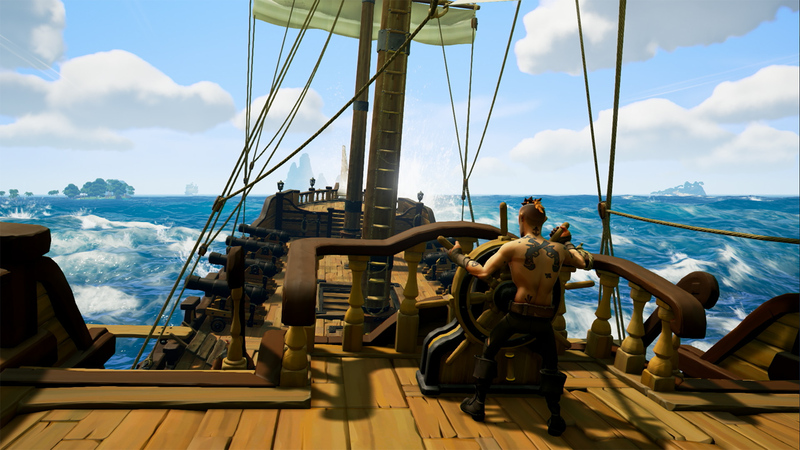 Rare is hoping to "try and hit a higher number of concurrent players than we've ever seen before" so it can test Sea of Thieves' server capabilities and fix problems accordingly. Pictured: A pirate trying very hard to ignore the invasive thoughts suggesting he do a barrel-roll. If you're an Xbox Insider or you were part of the Sea of Thieves closed beta, you're welcome to join the scale test. Just be aware the connection will be purposefully throttled at times for testing purposes, and that Rare is looking for feedback related to connectivity issues—not the content of the game itself. Speaking of Sea of Thieves' game content, Rare shared a new Inn-side Story about one of the MMO's emergent gameplay features: Skeleton Forts. Like shipwrecks and storms, Skeleton Forts randomly come to life, fill up with hyper-aggressive skeletons, and cough up oodles of treasure for any swashbuckling crew that manages to send the bony seadogs and their boss back to Davy Jones' Locker (or the nearest available nautical haunting ground). Whether you dispose of the skeletons on-foot or soften them up with canon-fire first, you're going to wind up with more treasure than your crew can carry at one time. If you've allied yourself with another crew to clean up your skeleton problem, you can split the goods and cement a long-lasting friendship. Or you can turn on each other and bleed all over the nice shiny stuff. Sea of Thieves is already looking quite a bit more robust than it did during its closed beta (take heed, seafarers: Rare intends to run another closed beta sometime after the scale test). Rare also has lots of content planned post-launch, and has engineered the game to run on older computers. Ideally, nobody will get left behind when the game sets sail in March. Tagged with Microsoft,	News,	PC,	Rare,	Xbox One. Microsoft's rumored console hasn't been announced yet, but it's taking shape regardless.